I remember when Kenneth Koch [1925-2002] came to read at the Iowa Workshop--this would have been in 1970 or '71--invited by, I assume, Anselm Hollo, as neither George Starbuck (the Workshop head at that point), nor Marvin Bell (who had the most influence among the regular faculty of poets) would have been likely to choose someone with Koch's credentials. In a cultural sense, this was still the "Sixties" and the strict partisan divisions which had characterized the poetry community since the late 1950's were alive and well. The competing camps seldom trespassed on each other's turf, and when they did, things could seem tense. Anselm introduced Koch that night, and went on at some length about how Koch had injected a breath of fresh air ("Fresh Air" being a poem Koch had published in 1956, not the title of Terry Gross's NPR radio program) into the American poetry mainstream. Whether or not anyone but a handful of us in that audience believed that to be true, is an imponderable, but Anselm clearly did, and wasn't afraid of saying so. The impression Koch made that night was of a wholly sophisticated New Yorker, quick on his feet, with a subtle wit and ready smile. Wearing a dark blazer, and bow-tie (as I recall), horn-rimmed glasses, with dark curly hair just beginning to grey, he cut a neat figure. Among the poems he read that night was "Sleeping with Women." 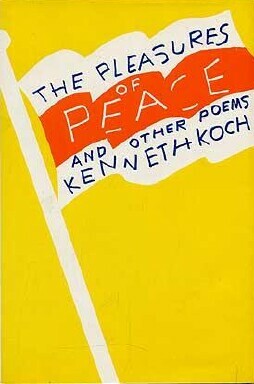 The poem had been published in Poetry (Chicago), and issued in a limited edition by Black Sparrow Press , before being included in his second collection of separate poems, The Pleasures of Peace and Other Poems [Grove Press, 1969], shown below. It was hailed at the time as a breakthrough piece for Koch, and continued for several years to be considered as among his best poems. Now, 40 years on, I suspect it's lost some of its luster for subsequent generations, but it still rings true for me. As expected, Koch read it as slapstick, though by the end, the repetitions had overcome his intention, and he, and they (the audience) were melancholy and joyous, the way people often are at a particularly moving opera performance. Clearly, this was at least partly what Koch was trying for, and the way people responded to it was a confirmation of his success. Women: sleeping in the dark. with women, everything sleeping with women. The guard: asking you for a light. Everything south of Naples: asleep and sleeping with them. Sleeping with women: as in the poems of Pascoli. Sleeping with women: as in the rain, as in the snow. On the starry foam, asleep and sleeping with them — sleeping with women. Mediterranean: a sea. Asleep and sleeping. The muddy sky, asleep and sleeping with them. Arm and thigh asleep and sleeping with them, sleeping with women. Asleep and sleeping with them. Of highly tuned women, asleep and sleeping with them. At dawn, sleeping with women, asleep and sleeping with them. The motto: a sign; the bridge: a definition. To the goat: destroy; to the rain: be a settee. O rain of joy: sleeping with women, asleep and sleeping with them. Sleeping with you; asleep and sleeping with you: sleeping with women. Sleeping with women, asleep with them. The silent bus ride, sleeping with you. and sleeping with them, sleeping with women. There's always a problem in talking seriously about Koch's verse, because it resists serious discussion, in my view. Koch was an educated scholar, and spent his life in college teaching. He was surrounded by intellects, in an environment of study and research and careful attention. How someone of his effusive and comedic nature should have chosen this life is a mystery. The poetry, and the world to which this poetry connected him, functioned, one senses, not as an academic duty, but as a kind of serious recreation. If Koch is at bottom a comic poet, his most direct models were the classical poets and playwrights of ancient Greece, and Rome, whose example and artifacts were both an inspiration, and a subject for blissful burlesque and parody. 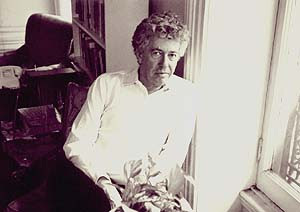 If contemporary audiences have trouble hearing Sophocles or Euripides as "straight" narrative or utterance, Koch's special combination of pop goofiness and wide-eyed credulity insists upon a purification of regard which persuades one that life is really simpler and easier than it seems. Koch's percolating poems, and nonsense plays, often exist in a kind of limbo of silliness and faux naivité, in which anything is possible, and care and anxiety and tragedy are kept at bay, in favor of clean fun and absurdity and cheerful color. This elevated sense of amusement is something he shared with O'Hara and others of the New York School, whose work and life-style--the hilarity and 'deep gossip'--prefigured the uncorked liberation and free spirit of the Sixties, Pop Art, Happenings, etc. Koch's poems often seem like cartoons, big two-dimensional canvases (perhaps like Alex Katz's paintings) peopled by the famous and the historical archetypes and monuments which preoccupied his professorial imagination. Koch suffered from a severe stutter, which improved over time; and also underwent years of psycho-analysis, partly to master the stutter. He was monogamous, and had family obligations, though his aesthetic persona suggested a camp life-style which was anything but traditional. His teaching style, augmented by several ground-breaking works detailing his theories and experience teaching poetry to children and the geriatric set, was unorthodox and demonstrative. The turmoils in Koch's life, which are only hinted at in his bio, suggest that the poetic persona he adopted was designed to compensate for problems in other spheres. Poetry may seem almost a kind of "art" therapy. (Denny Zeitlan--the great jazz pianist and composer--is also a full psychiatric professional, though he doesn't permit any cross-fertilization between the two roles.) Koch's "experimental" writing takes a unique form, and is most in evidence in his long, pop nonsense epic When The Sun Tries To Go On [Black Sparrow Press, 1969--though the poem is dated from the 1950's]. It's probably the most irrepressibly "wacky" piece of writing anyone has ever published. Koch's comic long poems, e.g., Ko, or A Season on Earch [Grove, 1959], or The Duplications [Knopf, 1977] and so forth, are parodic mock epics using uniform stanzaic forms. Koch's natural inclination towards farce and childish affectation are expressed as spontaneity and deadpan, but irony is never far below the pastel surface. Which is how I see "Sleeping With Women"--a comic-romantic farcical performance which is always on the verge of becoming serious. --set the tone and context for the rest of the poem. The poem's free-wheeling, rhapsodic caricature of a Mediterranean world is both a light-hearted imaginative tour through Koch's casual mental geography, and a metaphorization of a certain state of mind. For me, it's reminiscent of Crane, Vachel Lindsey, Whitman, continuing in a long line backwards in time to the ancient poets, for whom mere enumeration, or catalogues, or simple lists of things, or places, or names, constitutes the whole "subject" of a discursive poem. In our time, Ginsberg and Ashbery, for instance, have written poems in this same style. Koch's romantic inclination--an indulgence in hyperbole and giddiness--is balanced by his comfort inside classical structures. The inspiration for this, which appears again and again in his work, is a youthful "grand tour" nostalgia, perhaps for the period when he and his wife lived in Europe (France and Italy) during the mid-1950's. The tension between the mixed diction--often combining slang with elegant turns--and the ostensible air of formality, usually keeps his work from tipping over into stodginess. Enthusiasm and mystery, slapstick and dirge. Koch always keeps things sparking and twinkling with unexpectedly weird or pompous images or references. Toonerville Trolley, the dog-eyed genius, pro-canary, the black seacoast's sleeve, green polarity, 'true Renaissance had just barely walked by the yucca forest' [?? ], and so forth, balance the elevated references to Venice, Naples, Caruso, Crete, orchids. The poem satirizes the cosmopolitan mood it sets up while floating along on it own rollicking buoyant rhythm. It's a truism that being funny is ten times more difficult than being serious. Any fourth-rate preacher can conduct hand-wringing sermons, but every stand-up comic knows how demanding the podium can be. It often feels as if the ideal frame of mind for a Koch poem is mild inebriation, where the suspension of disbelief is helped along by a little dose of predisposition. I don't read Koch often, and when I do, I sometimes feel he's counting a little too heavily on my indulgence. But occasionally, as with this poem, where he seems to combine Walt Disney with Walt Whitman, all the frolic and froth seems worth it. There are probably some women out there who regard this poem as a sexist travesty. Pity them. Thanks very much. I really enjoyed reading this. Koch's lines are not meant (I believe)to be read as an insistent rhythm since it's to the speech (& poet's own quirky half-obsessed personality) that we're drawn. I love the way (a fact typically reinforced by meter)the current of obsessive thought always tends to get stuck at crucial (interestingly moral-psychological)impasses. The lines here have been so artfully arranged as to allow both rhythms & the curious inner tensions to arise. Here's poetry as antidote to the typical language slaughter of a lot of contemporary verse. Thanks for posting Koch's wonderful "Sleeping with Women" poem. This should be Bill Clinton's poem! I like how he plays with the innocence of sleeping (actually sleeping) as compared to the euphemism for screwing, which the term belies. It made me think of Bill Clinton who I think would really enjoy this poem. But I think Hillary Clinton wouldn't like it at all. The surrealist line of recursive litany as well as Whitman's line, his long sleepy lines, are here, but the coyness is all Koch's. That's interesting. Do you really think HIllary's the prude? I doubt it. She's hard as nails. She was happy to be Bill's girl, until he started messing around. Now that they're probably both celibate, she doesn't even pay attention to stuff like that. She's more interested in her "legacy" now. Maybe she'll have to build her own Secretary's Library and stock it with...who knows what? It will be photos of her running from live bullets in a Sarajevo of her imagination, probably. JH gets the pulse of the poem, and is dead on, as usual. what did Yeats once yawp? "all out of shape from toe to top"
I was going to say I remember this reading well, but, compared to your account, I should say "NOT so well!" Though this post has re-connected some synapses in the memory sphere. Thanks, Curtis. Was George Starbuck still head of the Workshop? Or was John Leggett? While Marvin Bell had locked horns with the New York (and like-minded) writers, my memory is that Starbuck was much more open-minded & enjoyed creating ferment. After all he invited Ted Berrigan, and couldn't have been unaware of Ted's (well-deserved!) reputation. Anyway thanks for posting this: a great memory (and history) piece. Bell: "You need to tell these people to knock this stuff off." Watten: "What do you want me to do about it?" Bell: "You know these people. This is unacceptable behavior!" Bell: "Tell them yourself, Marvin!" Anselm later told me Bell had nixed Berrigan's extension for 1969-70, in favor of Marshall/Fraser/Ray & co. Anselm was bitter about it, because he and Berrigan really liked each other. What happened with the "assassination" of the poet Ken Koch in 1967? Ben: Koch was a symbol to us of this totally bourgeois, dandy world. Myself, Dan Georgakas, Alan Van Newkirk and some of the other Black Mask people went to one of his readings. I think I came up with idea to shoot him with a blank pistol. Alan looked like the classic image of the bomb throwing anarchist. He was about six foot three, long and thin with a gaunt face and always dressed in black - the anarchist incarnate. So we decided "You're the one, you're going to shoot him." (laughter) We printed a leaflet and all it had on it was a picture of Leroi Jones with the words `Poetry is revolution.' On the night when Alan shot the blank Koch fainted and everyone in the audience assumed he was dead and started screaming . Some people threw the leaflet from the balcony into the crowd and then we all left. Reactions after the event were split between people who thought it was the greatest thing they'd ever heard and those that thought we were a bunch of sophomoric assholes. Which was great because so much of what Black Mask and The Family was about was pushing people to decide "Do I belong with this group of people or this one?" We were determined to be outrageous in order to force people to decide where they stood on things. We wanted to push people, force them to think. "Why shoot Koch? He's just a nice poet." Heh heh. Koch the "bourgeois dandy"--hey, that's like the Hallmark biz as a whole. Abbie Hoffman--not exactly a role model, but not a complete dunce-- thought along those lines too. Abbie had no love for Kirby O's Naropa palsies either.